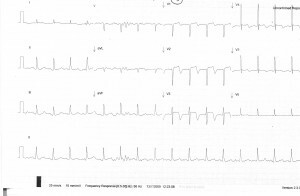 Most obvious changes are the septolateral biphasic T waves with ST elevation. This could easily represent LAD ischaemia (Wellen’s pattern), an old infarct with abnormal persisting repolarization or LV aneurysm. 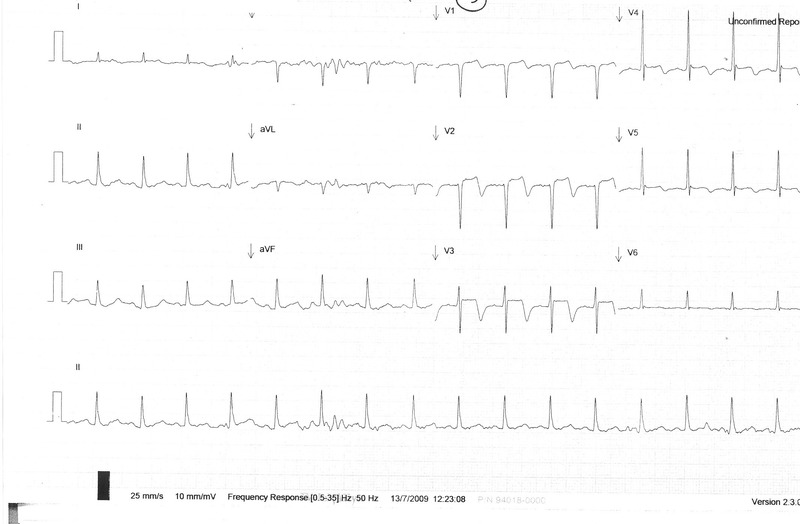 Collapse with septal TWI should also make you think of PE, although here there is not any signs of RV strain elsewhere. This lady had a large intracerebral haemorrhage. Commonest changes with intracranial pathology can include long QT (associated with insular cortex bleed), inverted (often deeply) T waves and U waves, but you can also get ST depression or elevation and big P waves.